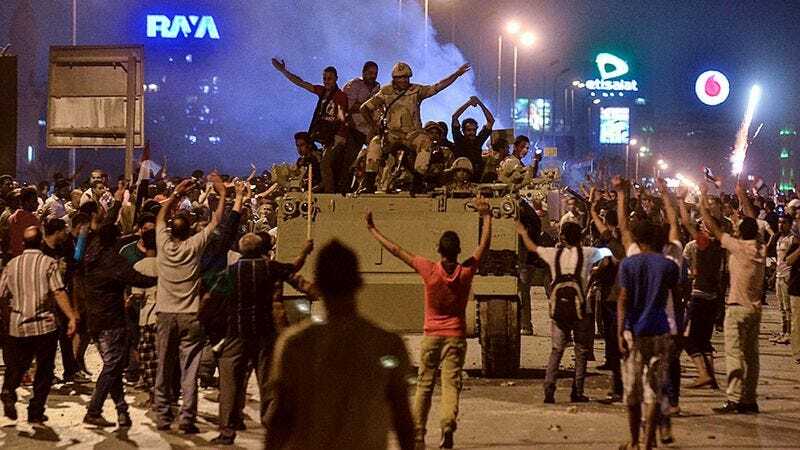 CAIRO—Responding to the ongoing struggle for power following the July 4 military overthrow of Mohamed Morsi, many Egyptian citizens expressed fears on Friday that their government may be toppling in the wrong direction. “These protests, the military power grabs, and the looming threat of civil war all make me wonder if this is how our society should ideally collapse, and if, in fact, we are utterly falling apart in the wisest and most prudent fashion,” said Cairo resident Chigaru Habib, adding that he believes there are “far better ways” in which stability should completely and irretrievably break down. “I remember a time—and it wasn’t very long ago—when Egypt was crumbling in harmony with the will of the Egyptian people, toppling bravely toward a future of peace and prosperity. But now it seems those days are long gone.” Planned elections next spring will reportedly allow Egyptians to vote on which direction the government will topple next.